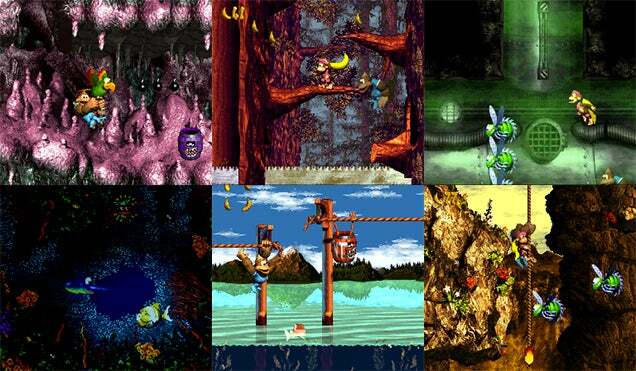 The Donkey Kong Country series contains some of the most beloved platforming titles to ever grace a Nintendo console. The series revitalised a classic villain as a hero. It boasted 3D-esque visuals in a market of predominantly 2D games. It had a swinging soundtrack so catchy that I bet you've already begun to hum the theme. 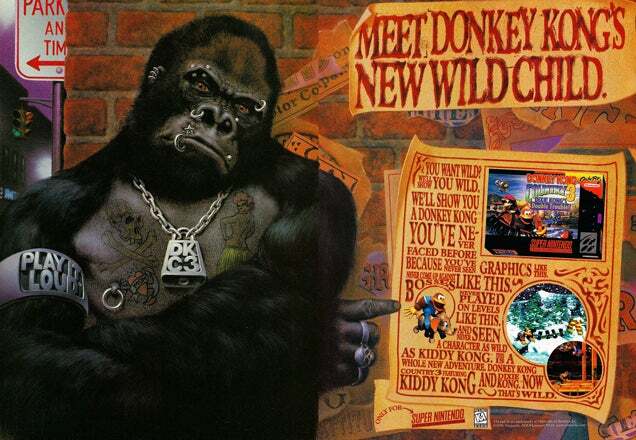 After the critical and commercial success of the initial Donkey Kong Country, Nintendo commissioned the fine folks at Rareware to produce two more titles in the series. Over the following few years Donkey Kong Country 2: Diddy's Kong Quest and Donkey Kong Country 3: Dixie's Double Trouble rounded out the original DKC trilogy. Both did decently well, but fell far short of their predecessor. In fact with only 3.5 million units sold, Double Trouble is the worst-selling title of the series with the exception of Tropical Freeze, which is hard to include seeing as it hasn't even been out for a solid year. The game's unfortunate release window, only months after the premiere of the Nintendo 64, led to its lacklustre sales and recognition. But being a not-so-great-selling game doesn't make you the best of the bunch or even cement your status as a cult hit. The magic in Double Trouble comes from a lot of different places. It's not the best Donkey Kong Country game in every regard, but let's look at why overall it's the best adventure two Kongs have ever had. The first spot where Double Trouble really shines is its well-crafted overworld. How does it differ from games the preceded and came after it? It gave a clear cut path, but also a chance to explore. Dixie and Kiddy, the heroes of the title, are tasked with rescuing their imprisoned cohorts and exploring the vast Northern Kremisphere. Let's take a gander. Beautiful, eh? Modelled after the mountainous and forested regions of Northern Europe and Canada, the Northern Kremisphere sure does have a lot of water (some might say too much). But it's the water that gives this world the small amount of freedom that is sadly absent from all other Donkey Kong Country games. There is no straight shot from point to point in these lakes and inlets. 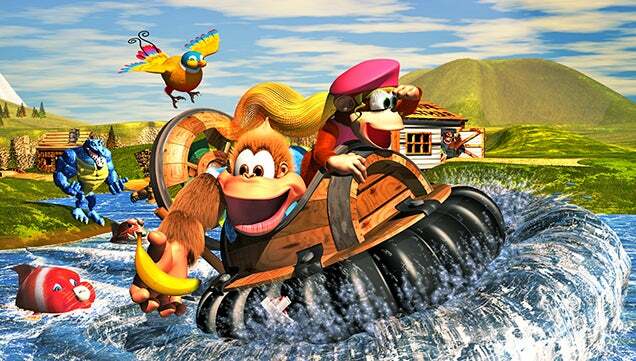 The Kongs are simply given different forms of aquatic transportation and told to find their own way. This forces players to explore and, unlike other side-scrolling Donkey Kong titles, it often let players choose their next location. Whipping around the waves in a hovercraft is a decidedly enjoyable experience. Within worlds themselves we find maps that are much more detailed and path-focused than before. I know I was just yammering about how the free the main overworld is, but what I'm getting at is the attention to detail that went into overarching level environments. You can slide down snowy hills, ride chairlifts up mountainsides and shoot yourself onto floating islands. 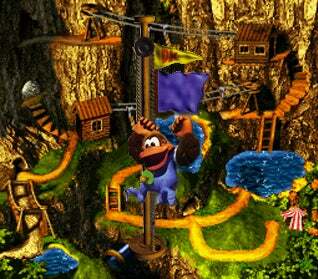 Previous DKC games had players running willy nilly all over poorly rendered backgrounds. The path was only clear because the game literally drew you a line to your next level. Double Trouble makes the map environment part of the story and not simply a pretty backdrop. Now, I'm not going to sit here and tell you that Donkey Kong Country 3 has the best soundtrack of the series. It doesn't, plain and simple. That title goes to DKC2 hands down. But, like I stated above, one category does not a "best in the series" title make. While not top banana in the audio department, Double Trouble does have a fantastic soundtrack superior to most gaming soundtracks in existence. And it's soothing as all get-out. Like most DKC titles, the tunes produced by composers David Wise and Eveline Fischer perfectly compliment the levels they are linked to. Unlike the classic underwater lullaby "Aquatic Ambiance", the haunting melody of "Water World" creates an uncertain atmosphere that will make your love-hate relationship with underwater levels that much more confusing. Another fan favourite from Double Trouble is the wonderfully '90s track dubbed "Rockface Rumble", which is also what I plan on naming my band (if I ever start a band). It has the all the tension of a sprawling mountain adventure and all the screaming guitar riffs of a hair metal rock concert. It's not Stickerbrush Symphony or Jungle Groove, but it brings out some fine level atmosphere. There are two kinds of kongs in Donkey Kong Country — nimble ones and strong ones. The original team of Donkey and Diddy was a great mixture of both, but unfortunately they couldn't interact as a team like duos in Kong Quest and Double Trouble. In the second DKC instalment, Diddy and Dixie both had the same type of gameplay, aside from Dixie's helpful hair-licopter abilities. In fact, Dixie's hover skills make her the ideal nimble partner. Kiddy Kong is far from the most popular kong among fans, and it seems the designers knew this would be the case. Luckily they loaded him down with all sorts of special abilities such a ground pounding, water skipping and Dixie tossing. Thus the epic twosome of Dixie and Kiddy was formed. A team that can work together and yet represents two opposite ends of the kong spectrum. This balance of strong and nimble, the kongs' distinct special abilities and their unique teamwork system earn Dixie and Kiddy the title of best team-up. Would you like be chased by bees? How about lightening? How about the biggest crosscut saw in the world? If you said, "Yes, but only in a video game please," then do I have news for you. Donkey Kong Country 3 has some of the most creative level designs and gimmicks gaming has ever seen. The game takes the risk of introducing you to a brand new concept in nearly every level you encounter and the best part is that they don't hold your hand in the slightest. There is no sign saying, "Your directional controls are reversed for this underwater level," or "This level is in slow motion". You just have to figure that out all on your own and adjust accordingly. It can lead to some quick deaths and frustrating learning curves, but boy does it bring a feeling of excitement rarely seen in today's platformers. Other Donkey Kong Country titles have done a pretty swell job of mixing up the madness, but Double Trouble does it best. And screw that lightening level. Seriously. The Donkey Kong world is no stranger to off-kilter enemies. Why there are vultures deep in the jungle and why beavers are running wild in poorly lit industrial facilities I'll never know. There's no need to explain though. Part of the DKC charm is in its underlying strangeness. Unfortunately the bosses in the original are a little too in-sync with their lesser counterparts. Fight a bunch of little vultures? Fight a big vulture boss! Massacre a hoard of some mindless beavers? Fight an oversized beaver boss! Not only that, but every boss battle (aside from the final bout) takes place in the same banana-filled cave. It's not too creative when you come down to it. Things certainly pick up in Kong Quest with the the addition of some new boss mechanics and much more creative settings. Though there are still two giant vulture bosses... now with pirate hats! It all matches up nicely with the whole "murderous pirate lizards stole my friend" plot, but it's far from the best boss line up. Then comes Double Trouble, and things get absolutely bananas (GET IT!?). No beavers, no vultures, in fact not even any reptiles, which seems odd, all things considered. You've got an enormous gassy barrell who kills himself by burping, an evil snowman who appears to laugh himself to death, and a giant slug who lives inside a waterfall. That's not even all of them. It's all very bizarre, but Donkey Kong Country is the most fun when it's at its weirdest. In the autumn of 1996 every kid wanted to get their sweaty mitts on a shiny new Nintendo 64, and apparently we weren't the only ones. Deep in the bowels of Wrinkly Kong's save cave, players can find a familiar system and a familiar tune. While Wrinkly can be found both napping and getting her sweat on, it's only when she has powered on her N64 that we get to hear the well-known tune of Peach's castle from Super Mario 64. Not only is the Nintendo 64 present, but it also appears that Link has made his way through the North Kremisphere on his travels. One of the first characters you meet, Bazaar the bear, will mention his encounter with the legendary hero of time. Cheat codes are another part of Double Trouble that weren't used by the series much before or after the title arrived. There are various codes that can be entered that range from making the game insanely difficult to changing all the bonus areas into Christmas-themed wonderlands, with both new music and icons. It shows the level of work and care that went into making the game as well as locking away its secrets. In the first two rounds of K. Rool kon-nappings, it isn't very well communicated how much you've achieved in each level or world. Usually you'll just turn an enemy head icon into a that of a playable character. That's it. All you know is you beat that level. It can be frustrating because you're not sure what levels to return to on your second go. Even Kong Quest's method of adding an exclamation point to the end of completed levels was too subtle to really help out most gamers (especially younger ones). Modern DKC games have gone the opposite direction. They shove those missing items in your face. All you have to do is browse over a level and you can see all the puzzle pieces, KONG letters and other memorabilia that you've missed. It's nice, but it's almost too much to take in. Enter the Double Trouble flag system. Perfection. Different color flags for different aspects of the levels. Are they all up? Then you've found everything. Are any down? Then you need to go explore a bit more. It's simple and it doesn't make you feel guilty by showcasing your missing trinkets. Nice friendly flags. What, you need an explanation as to why this is amazing? 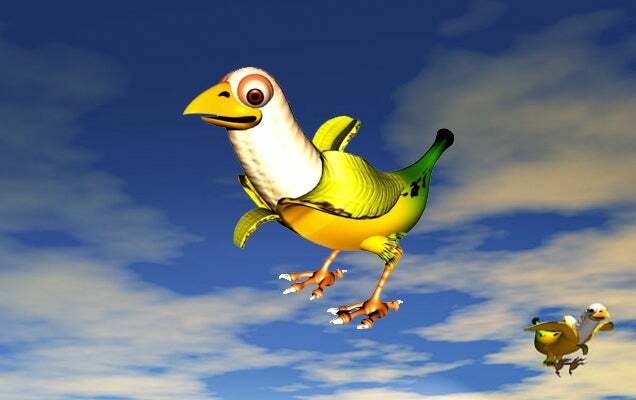 It's a banana... that is a bird. The Donkey Kong Country series as a whole is a fantastic example of how 2D platforming should be done. It's a delightful mess of primates battling through an ever-changing world of ridiculous baddies. But when it comes down to which title in the series stands above the rest in an overall mix of gameplay variety, overworld/level design, music and atmosphere — Donkey Kong Country 3 takes the banana cake. Ben Bertoli is a teacher and games journalist from the US. He spends much of his time hugging his Donkey Kong arcade machine. You can follow his antics on Twitter or find out more about him on his personal site.